The email address above is for that purpose alone. We would prefer to sell the vehicles as-is, but in the event that we do not receive suitable offers the vehicles will be broken and the parts sold. The first vehicle was built by us, and has a centre tandem seat conversion (steering wheel in centre), tapered roof drop, and dramatic steel welded bodykit which will never crack. The car is a total one-off, including F1 inspired sidepods. Almost 1000 hours were carried out on this car, but the customer has been unable to pay his bill, so rather than storing it any longer, we are selling off the vehicle or parts to recover as much of the unpaid bill as we can. This car went through several evolutions, including those on these pages, although bears no resemblance to the car pictured here, which was the starting point only. The car will start and drive with a new fuel pump and fuel line. Currently only a 1.1 engine this is easily changed for a VTR/VTS engine. We would accept offers for the shell, although it might be extremely difficult for anyone to complete. We estimate the car needs around £20,000 to complete (labour mostly), and would make a very strong promo-car for any company with the funds to complete. The second car was very poorly built by the now defunct Midas Styling in conjunction with another also now defunct company. The car was featured on the cover of Fast car, and within Gti magazine. The interior is missing. Complete centre driving vehicle with wheels. As-is we are looking for £7500, or we will break. It should be noted that the labour and parts already invested into this car is almost £50,000!!!! Most of the work is done, and certainly most of the complex work. 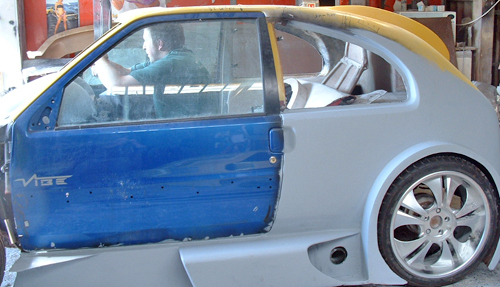 the doors need installing, and the shell preparing and painting. Set of brand new and unused 20" alloys to fit BMW X5, with tyres. Value around £2500 when new - best offer secures. Tyres are 255's. These wheels are beautiful. Wheel adapters to change Peugeot 106 and Saxo 4 stud to BMW X5 pattern - very wide, needs ultra wide arches. Suit wheels above. Replacement cost between £300 and £700. Set of four. Hydraulic system for Saxo or 106. Includes everything needed to fit hydraulics to a 106 or Saxo. Pump, cylinder, pipes - entire kit will bolt on - front strut welding has been done. 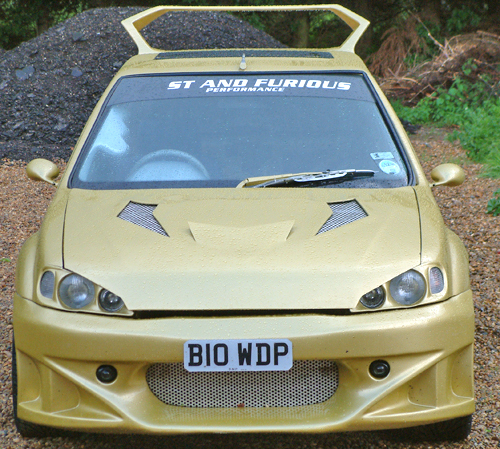 This kit was new and fitted to the car some time ago - it has never been driven on the road. Cost of new kit - £1200-£1500, plus £800 fitting. Could be fitted if you need. Centre driving conversion parts. These alone cost £2000 in development to design, build and install. Most other parts were custom built for the car - including upright fuel tank, and are unsuitable for use on anything other than a very exotic modified car. Twin side exit underfloor exhausts (one in left skirt, one in right skirt), full fibreglass interior. Headlining GRP build to take amps, and screens, which would fit another 106/Saxo but which was built to have a light mould taken , and a light weight copy made - this thing weights a ton. Development cost £2000. Complete vehicle minus interior and ICE. This car was featured on the cover of Fast Car some time ago, and also in Gti magazine. The opportunity to purchase a cover car does not come along all that often. Needs thorough rebuild - kit rippled and fuel filler conversion was a potentially lethal combination of a plastic coke bottle, slid into a pipe, which filled the car with petrol fumes!! !, and leaked if over half full. 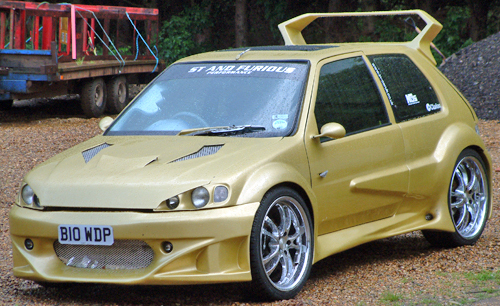 This car cost a lot to build, and the initial customer is rumoured to have spent over £20,000. We will part with the car As-is for the sum of £3500, with all parts listed below including new wheels. Set of Mercedes 5 stud 20 inch alloys with low profile tyres 225. Brand new a year ago - fitted to car, but it has never been driven. Cost around £1600 new. Set of 4 Wheel adapters to adapt Saxo and 106 4 studs hubs to 5 stud Mercedes wheels. These will allow the Mercedes wheels above to fit a 106/Saxo and whilst narrower than the adapters above will still require wide arches. Front bumper, as featured on Cover of Fastcar. Bare Shell, including doors with pods built in. ALL PARTS WILL BE SOLD TO THE BEST OFFER WE GET IF THE COMPLETE VEHICLES DO NOT RECEIVE SUITABLE OFFERS. Neither car has a V5c included with it, but we have served legal papers on the customer which means that these would be easy for a new owner to obtain, and we will provide paperwork to make this happen, if needed. We are now the legal owners of both vehicles and all parts. Andy is well known to most show goers, cruisers and modifiers in our area. From my personal experience I believe him to be a lying, stealing, scumbag, and pretty much everyone in this industry would be wise not to deal with him. Certainly do not "sponsor" him, as our understanding is that he normally just sells the parts!! 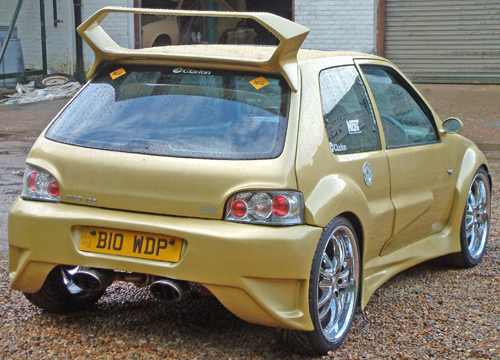 His Gold Peugeot 106 seems to be at every event and it was featured in Max Power a few years ago. Some time ago Andy asked us to bond some wide arches on to his car since he did not really trust the work of his normal bodyshop with this very difficult aspect of car modifying. He had heard that Autofashion boss Phil, was a bit of a wiz at bonding parts onto cars, and more importantly getting them to stay on - something not every so called bodyshop can manage. As is often the case one thing led to another, and another and before you know it Andy had asked for a pretty major body styling project to be undertaken. One spanner in the works was that it had all been left a little late ( a couple of weeks before Donny to be precise), but we said "we would do what we could". 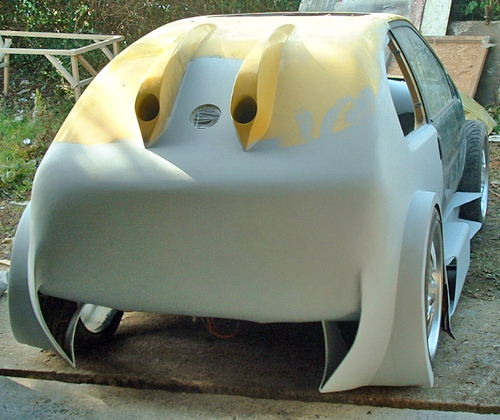 The Project called for one of our Universal Orimental Front bumpers, Universal Animal wide arches (suitable for the planned 19's which then shrank due to time constraints to 17's), Universal Orimental sideskirts, Hybrid Animal/Standard rear bumper, Animal bonnet vent, and Animal bootlid spoiler. To make things a little different, the car was also fitted with 306 headlights, and the wings and bonnet extended so it all looks right. Then the bonnet was bad boy'd. The arches and skirts were bonded on so they look part of the bodywork, and the wonderful skirts blended into the arches in a way that looks so natural it almost seems that they were meant to be, even though they are different kits. The rear bumper is actually a very heavily modified BMW MINI rear bumper, with added rudder. The spoiler was extended to make it look sleeker, and the bonnet vent added. Due to the fact that Donny was so close and Andy was adamant that he wanted to go even if it was in primer, we were not able to do the proper paintjob for the show - indeed most of the bodywork was unfinished, and the car coated in white primer, and then some sparkle lacquer to seal it. It looked surprisingly good considering its part finished status and got a great deal of interest. The car was scheduled to return the following week but it was some time before it did (the week before Max Power Live to be precise), due to a couple of unfortunate incidents - the engine blew up, and the bonnet wasn't closed properly and flew up at 70 mph. The later put the bonnet through the windscreen, broke the metal hinges, and mangled the metal corners, but did not even crack the bonded on Bonnet vent!!!!! Thus stage two with its colour change multi-tone paint work was slightly delayed, and the last of the paintwork was actually applied a few hours before Max Power Live opened in 2003. 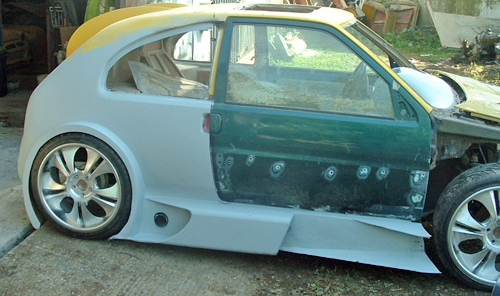 The car is now deep in the midst of being rebuilt for Max Live 2004 - you just won't recognise it! It's big, it's bold, it's not like anything that's gone before, and certainly won't be to everyone's taste. Both Autofashion and Andy like to lead and not to follow, and the 2004 car illustrates this perfectly.